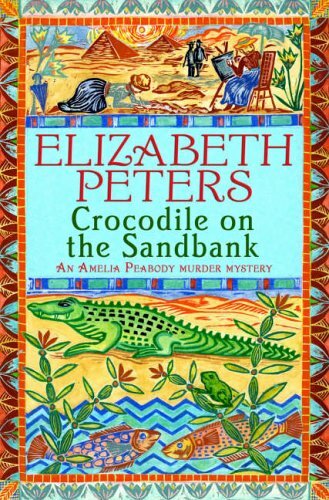 Crocodile on the Sandbank is the first of Elizabeth Peters’ Amelia Peabody books, a series of historical mystery novels set in Egypt and following the adventures of a Victorian lady with a passion for archaeology. When we first meet Amelia at the beginning of the novel, she has recently inherited a fortune following her father’s death and is planning to use some of her money to visit Egypt. Passing through Rome on her way to Cairo, Amelia rescues a young woman, Evelyn Barton-Forbes, who has been abandoned by her lover and the two become friends and travelling companions. After they arrive in Egypt, Amelia and Evelyn meet archaeologist Radcliffe Emerson and his younger brother Walter, who are working on a dig at Amarna. The two women soon team up with the Emerson brothers to tackle a mysterious mummy who seems to be stalking them at night! Amelia is the book’s first person narrator, but I wasn’t sure at first if I was going to like her. She has a very sharp, witty narrative voice and for the first few chapters I found her alternatively amusing and irritating. Luckily though, after I got to know her better I started to warm to her. As well as being outspoken and sarcastic she’s also brave, intelligent and loyal to her friends – and definitely not a conventional Victorian woman! Emerson is a very strong character too and I enjoyed watching his relationship with Amelia develop. Although I am interested in history, Ancient Egypt has never been one of my favourite subjects to read about, but Amelia and Emerson are so enthusiastic about Egypt and archaeology that I ended up with more enthusiasm for the subject too. The adventures they have exploring tombs, discovering mummies and deciphering hieroglyphics all sound so fascinating! The mystery itself wasn’t one of the novel’s strong points though. It was hard to believe that someone as intelligent as Amelia wasn’t able to immediately work out what was happening and who the villain was. But like Alan Bradley’s Flavia de Luce mysteries, I think the charm of this book was in the setting and the characters (or Amelia and Emerson, at least – the other characters didn’t have a lot of depth) rather than the mystery. The overall tone of Crocodile on the Sandbank is light and entertaining and although I’m not completely convinced about this series yet, I did like this book enough to want to read the second one. I’ll remember to pick up The Curse of the Pharaohs next time I want to relax with another fun Egyptian adventure. This looks like a nice, cosy read. I love books set in Ancient Egypt and VIctorian settings, so I think I would definitely like this one. Yes, I think there’s a good chance you would like it! I read this and the second in the series, and while I didn’t enjoy it as much as, say, the Mary Russell books, I agree it’s a lot of fun. I’ll need to pick up the third book at some point. I’ve only read one of each series, but so far I prefer Mary Russell too. I need to make sure I continue with both series and don’t forget about them! Books set in Egypt don’t usually appeal to me, but I really enjoyed this one. I really enjoy Elizabeth Peters’ books, particularly the Amelia/Emerson books. I recently read one of her stand-alone novels, The Jackal’s Head, that I’d swear was a dress-rehersal for the later Emerson books. This is the first of her books that I’ve read but I’m sure I’ll be reading more. I’d be interested in trying some of the stand-alone ones too. I love Elizabeth Peters – and when she writes under her other hat Barbara Michaels too. The later Amelia Peabody novels go a bit over the top but the Vicky Bliss ones are wonderful, very witty and Sir John Smythe, well that’s what he says his name is anyway, a crook who always tries to do the wrong thing but often ends up by inadvertantly doing the right one, is one of the best love interests around. I had never realised she had written so many books! I’ll have to look out for the Vicky Bliss ones. This book is the perfect mixture of cosy crime and Egyptian history, so if you like both I’d definitely recommend giving it a try! I enjoyed this one too, but I’ve not yet gone back to the series. I think I’m a little addicted to starting series and not persevering, even when I wholly enjoy them. There’s always another one catching my reader’s attentions! I seem to have the same problem! I’ve started so many series in the last few years and have never gone back to them. I really want to continue with this series though, so I’ll have to make it a priority. Elizabeth Peters is one of my favoite authors and this series has to be at the top of my list. I love the way she has taken historical acrhaeological figures (like Maspero, Peitre, and Carter to name a few that show up over the series) and weave them into her stories. I was not sure if I would like the books when a friend gave me a copy of the first one to read, but I have grown to love the Emerson family and look forward to every book that gets added to this series. I will be very sad the day she stops writing them.